According to some statistics, 84 percent of hunters never leave their home states. That's deplorable. It's time to go somewhere radically different than any place you've previously hunted. For most whitetail addicts, that means the West. Finding a good Western whitetail spot isn't hard, but in some cases affording it might be. I leaned on fellow writer and friend Ron Spomer, who is the host of Winchester World of Whitetail, a Westerner who has vast experience hunting whitetails. I pressed him to reveal three regions that offer good Western whitetails. As you would imagine, he had a lot to say on the subject. His first suggestion is the upper part of his home state of Idaho, north of Grangeville. The area consists of a vast mix of farm ground and forest, private and public — important for DIY hunters that prefer to avoid access fees and dancing around a landowner's rules. Even though access is quite available, there is still good hunting with the potential of shooting a big buck because, according to Spomer, "There's enough sanctuary and deep forest for escape&apos;¦. Bucks roam from 8,000 feet down to river bottoms." Whitetail migrations also occur in northern Idaho — behavior unfamiliar to most whitetail guys — especially in years with heavy snowfall. The manager of my local Sportsman's Warehouse in Utah also hails from Idaho and still makes a yearly pilgrimage north to stalk big whitetails in the big timber of the state's panhandle. According to him, hunting is fantastic during years with heavy snowfall. Pack warm clothing and plan your Idaho whitetail invasion around mid-November. Comfortable, waterproof boots can be critical; spend your days still-hunting down logging roads or following big buck tracks the way of the Benoit Brothers. "If you're one of the 84 percent that never hunts out of your home state, do as the old saying suggests and "Go West, Young Man." 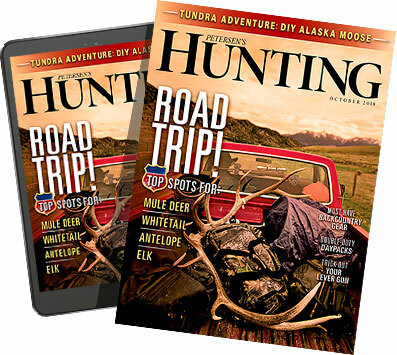 Kick out of the traces and venture where the whitetail hunting is anything but normal." Best of all, according to an unnamed agent in north Idaho's DNR field office, buck tags — as long as you select the "whitetail-only" option — are available over the counter (OTC) for $301.75, and nonresidents may purchase two. One caveat: Before purchasing a tag, you're obligated to buy a state hunting license for $154.75. The whitetail-only season runs October 10th through December 1st. If you want a true Western stomper whitetail, your best bet is almost assuredly eastern Colorado. As Spomer pointed out, access is horrible since almost all the land is privately owned or leased up by outfitters. However, if you've got the financial wherewithal, hire one of those outfitters, pay the obscene fee for the landowner tag they control, and hit the wide-open country for the big buck hunt of your life. Be warned, such hunts are bafflingly different from the wooded East, South, and Midwest. Enormous crop fields rimmed with scant brush provide cover and habitat, along with the occasional brushy creek bottom or abandoned farmstead with pioneer-planted trees. You'll stalk through howling December winds, glass rippling prairie country until your eyes water and frost forms on your eyebrows, and likely attempt a shot on a giant buck off wobbly shooting sticks in waist-high grass. Get away from your treestand, and adventure will come calling. For a fun, low-pressure hunt in spectacular country, northeastern Wyoming is tough to beat. I hunted pronghorn there a few seasons ago and put a crick in my neck staring out the window at herds of whitetails — including some very respectable bucks — each morning and evening as we wound our way over country roads en route to our hunting area. You'll likely have to hire an outfitter because public land is rare in northeast Wyoming, but cost — like accommodations — will be humble, your hosts down to Earth, and the hunting action-packed and surprisingly good. You'll likely have to put in early and draw a tag, although in many regions leftover tags come up for sale in mid-July. A list of such tags is made available online at www.wgfd.wyo.gov soon after the spring draw, and your purchase can be made online as well. Cost for a nonresident buck tag is $312 plus a $12.50 state conservation stamp. Season dates vary widely depending on region — a visit with an outfitter will help you resolve all those details. Again, treestand chess-game whitetail techniques don't apply. You'll likely glass river bottoms from bluffs and ridge tops, stalk through sage and down eroded cuts off the bluffs, and potentially go prone for a long shot on a big buck skulking among cottonwood-lined alfalfa fields. If you're one of the 84 percent that never hunts out of your home state, do as the old saying suggests and "Go West, Young Man." Kick out of the traces and venture where the whitetail hunting is anything but normal.